Forterra Systems issued the below press release last Friday to announce that InWorld Solutions is a new partner who has developed a virtual behavioral healthcare solution called InWorld based on their OLIVE virtual world platform. InWorld Solutions LLC was created by a partnership of experts in the fields of neuroscience and clinical psychology from Greenleaf Medical and CFG Health Systems. Their product InWorld was officially launched at the American Psychological Association conference in Toronto last week and will be commercially available in October 2009. SAN MATEO, Calif. - Forterra Systems announced on August 14th that InWorld Solutions™ premiered its InWorld product at the recent American Psychological Association (APA) conference in Toronto. Developed using Forterra’s On-Line Interactive Virtual Environment (OLIVE™) virtual world platform, InWorld is the first Internet based virtual environment designed specifically for behavioral healthcare. Executives at Forterra Systems are optimistic that pioneers like InWorld Solutions will continue to transform other vertical markets. The widespread availability of broadband Internet and PCs both at work and home enable a new breed of visually rich, highly interactive 3D applications. Savvy entrepreneurs are recognizing the market potential made possible by leveraging mature virtual world platforms like OLIVE to rapidly and inexpensively create industry-specific virtual world applications. The enthusiastic response at the APA meeting suggests that the use of InWorld will extend beyond clinical use to include training, supervision, and education. OLIVE’s virtual world technology provides a communication medium that enables multiple participants to meet, interact, socialize, and solve problems online with higher levels of immersion than ever before. Early adopters of virtual worlds have found that their experience yields greater engagement and effectiveness compared to other communication alternatives. InWorld, for example, helps overcome emotional and cognitive barriers to therapy by engaging clients and mobilizing their active participation. Therapists, patients, and family members can meet together from PCs located anywhere with Internet access. In addition to local or remote use, OLIVE offers InWorld a wide range of new interactive tools, such as the ability to replay sessions from different perspectives. Taken together, these tools deliver new options for customers to increase their overall effectiveness and extend their reach. Forterra Systems and the OLIVE virtual world platform are well positioned to help emerging companies address these new business opportunities. OLIVE has several unique features important for multi-user 3D applications such as InWorld. Built-in automatic avatar animations replicate human behavior such as blinking-eyes and lips synchronized to speech so users feel immersed in the virtual world. Users also have access to keyboard-driven gestures like clapping or raising a hand. 3D audio that is high quality and spatially accurate yields a deeply immersive experience. All users know exactly who is talking. 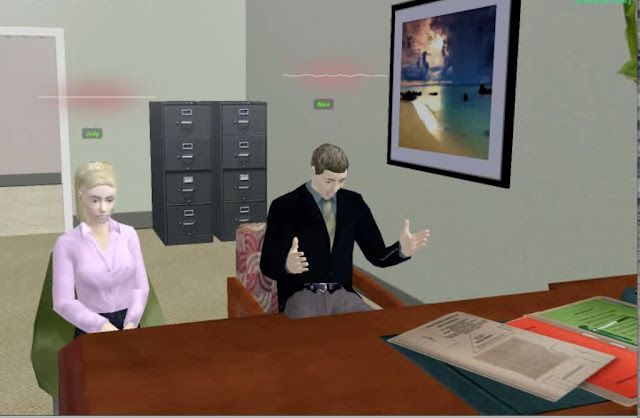 3D record and replay allow role-playing scenarios to be reviewed by therapists, subject matter experts, and the patients to assess performance. Privacy and security features enable HIPAA compliance and confidential document sharing and discussions between users. Document and media sharing allow virtual offices or meeting rooms to be as productive as real world offices. Drag-and-drop presentation of Powerpoint slides, clickable access to manuals, and meeting scheduling enables productive collaboration. Forterra offers developer programs that help customers rapidly create and pilot prototype applications by bundling together a 6-month non-production OLIVE license, access to thousands of vertical-specific 3D objects, training, expert mentoring, and support. The cost of these programs is easily affordable by self-funded or seed- and angel-funded start-ups. commercially available in October 2009. Forterra Systems is a leader in providing enterprise grade virtual world technology or the corporate, healthcare, government, education, and entertainment industries. Forterra's software and services enable organizations to train, plan, rehearse, and collaborate using existing media technologies integrated into a compelling 3D virtual world. Using the OLIVE™ platform and industry standard PC hardware, customers can rapidly generate realistic, collaborative, 3D Internet solutions that scale from small team applications to large scale simulated environments supporting many hundreds of concurrent users.